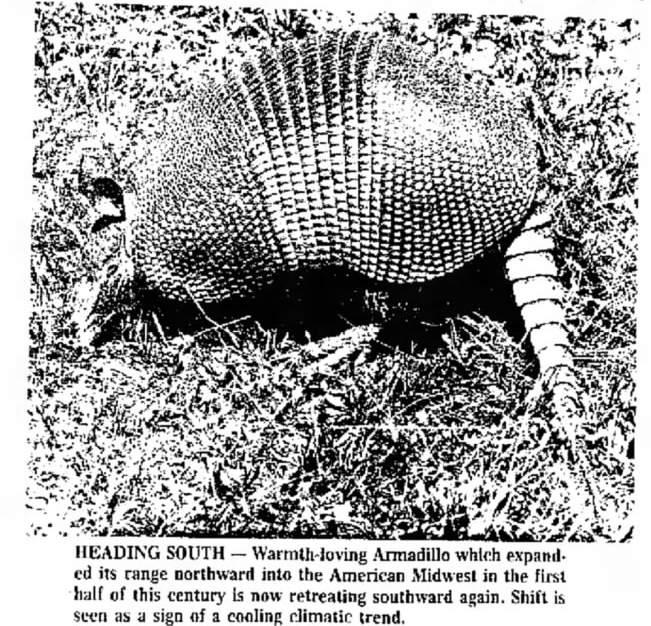 Armadillos were the mascot for both 1970s global cooling fears and the mascot for current global warming fears! 2011: Scientific American: 'Armadillo Moves North Across a Warmer North America - The armadillo is moving north thanks to climate change' - Some of that migration can be attributed to opportunity: The armadillo in particular has been moving northward since it arrived in Texas in the 1880s and Florida in the 1920s, according to Colleen McDonough, a biology professor at Valdosta State University in Georgia. Some, however, is clearly triggered by a changing climate. Armadillos have settled into southern Illinois, Indiana, Kansas and Missouri - all areas that were "totally unexpected," McDonough said. Watch: Exclusive clip of ‘Climate Hustle’ on Fox News – Steve Doocy & Marc Morano reveal mystery climate mascot animal - The Armadillo! Fox News on Sunday April 24, 2016 invited Marc Morano to explain how the armadillo was both a mascot for 1970s global cooling fears and a mascot for current global warming fears. [It’s Here! CLIMATE HUSTLE DVDs and Blu-rays are NOW AVAILABLE! Order yours today!